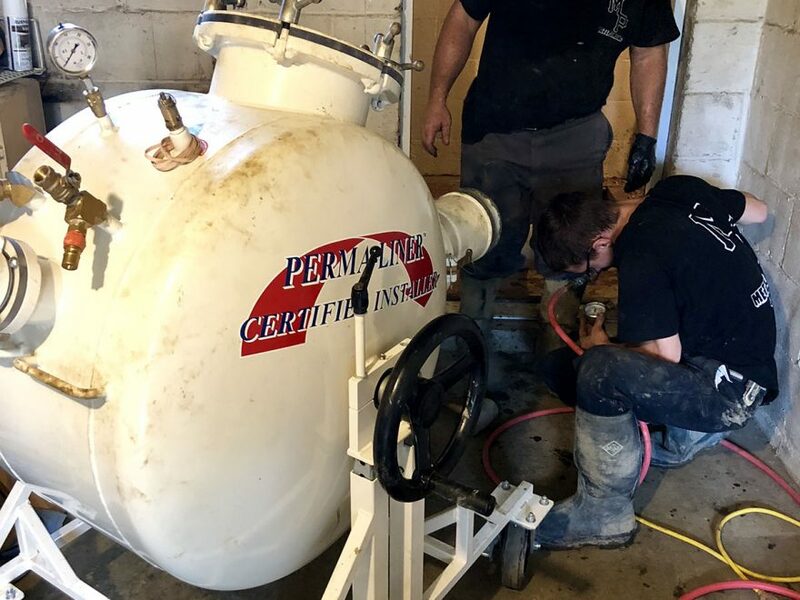 Founded more than 15 years ago by Robert Metz and located in Pittsburgh, Penn., Metz Plumbing & Sewer Lining recently completed a CIPP job in East McKeesport, Penn. Their customer is currently trying to sell their house and a lateral inspection by the city failed due to root intrusion and numerous cracks throughout the 6” terra cotta line. The customer dug the access at the house trap inside the house to keep their costs as low as possible. The Metz team were able to shoot the 6″ liner through the access they made, out to the city main located in the street. The CIPP method definitely saved this customer a tremendous amount of money. If lining wasn’t an option, an excavation would’ve involved digging up a public sidewalk and the street, resulting in thousands and thousands of additional funds needed in order to pass the lateral inspection for the house sale. If you are looking for information on protecting, lining and repairing pipes, or for the nearest installer, contact Perma-Liner™ today. Perma-Liner is the leading manufacturer and supplier of trenchless pipeline rehabilitation equipment and materials in North America. For 20 years, we have developed systems to rehabilitate existing sewer systems without excavation. Our experience in the CIPP industry has allowed us to design, patent and manufacture state of the art technology in order for us to repair structures without excavation.